Guys, I've discovered my favorite lip balm ever. This is not a drill. My unquenchably dry lips have finally found a formula that keeps them hydrated for more then five minutes at a time, and I truly have the brand Leaves of Trees to thank for that. With clean (and ethically sourced) ingredients formulated around Moroccan argan oil, as well as the most adorable packaging, my only regret is not trying this lovely brand sooner. First up let's talk about this fab lip product, the brand's Moroccan Mint Lip Balm*. 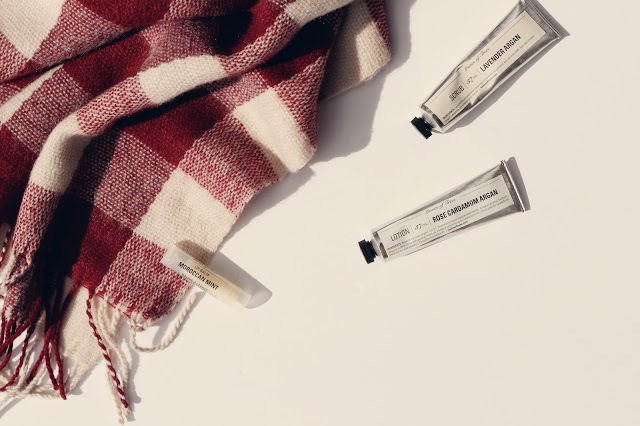 With unprocessed beeswax, cocoa butter and unrefined argan oil, this formula promises to keep your lips hydrated for hours, a claim I've heard so many times and yet with this one it's true. So, weirdly enough, the formula actually goes on kind of dry per se. I don't quite know how to explain it, but you know when you use a lip balm that leaves your lips with all kinds of gunk on top? This is not that. It applies dry and yet leaves your lips perfectly nourished - instead of just having the formula sit on top of your lips it truly sinks right in. Combine that with the fact that it smells and tastes of fresh mint and you have me sold on my new favorite lip balm. Seriously I cannot tell you how wonderful this stuff is, and how much it has saved my chapped lips. I don't even need to reapply every few hours, it's that good. With how stunning their lip balm is it's no surprise that the rest of their products are equally fantastic. Housed in the two beautiful toothpaste-like tubes you can see above, their Rose Cardamom Argan Hand Lotion* and Lavender Argan Scrub* are two powerhouse formulations that come as seriously affordable prices for their high-performing capabilities. Both smell beautiful, unsurprisingly, but they are also incredibly powerful. The Lavender Argan Scrub* gets its exfoliating properties from brown sugar which, when combined with the pure lavender and argan oils, leaves your skin both feeling and smelling absolutely heavenly. The Rose Cardamom Argan Hand Lotion* has an equally gorgeous floral aroma, and the formula lends itself well to keeping your hands unbelievably soft without any leftover greasy residue. It absorbs quickly and leaves your skin soft and nourished (and smelling lovely, obviously). Have you guys tried anything from Leaves of Trees yet? Let me know in the comments below!